One would think that divorce in couples over the age of fifty, together for years, would not be as common as for younger couples; however, statistics say otherwise. Grey Divorce is now a trend in the 21st century. In the 1990’s; 1 in 10 couples over the ago of 50 got divorced. Now; 1 in 4 people are going through Grey Divorce and it doesn’t appear to be slowing down. As a Certified Divorce Coach and founder of Better Path to Divorce, I have seen an increased number of couples seeking my services after making the conscious decision to end their 20, 30 and even 40-year marriages. Unfortunately, divorcing at this later stage in life is particularly challenging. The experience is emotionally and financially traumatic. With that number of years under your belt, truly believing your relationship stood the test of time, and then to realize that what you thought was normal marital dissatisfaction turns into an intention to file for divorce can be earth shattering. One or both parties that have accumulated hard earned pensions, retirement accounts, etc. ; (which was considered a joint asset), is now subject to division post-divorce. This becomes a major challenge to the partner that was the major wage earner during the life of the marriage, as the plans for a comfortable retirement has just been cut considerably. On the other hand, the spouse that wasn’t working for many years, also planning a comfortable retirement, might have to now re-discover the employment market. Clearly, 50% of planned retirement funds may not be sufficient to cover the bills of the now two individual households. 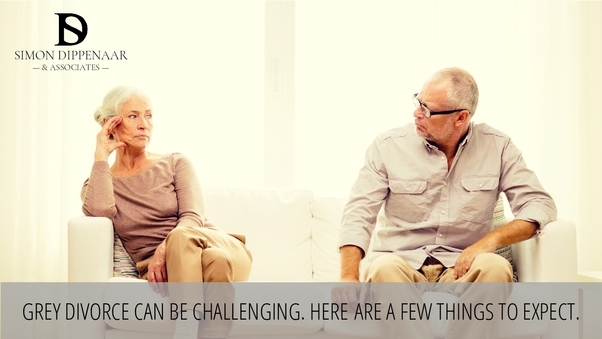 Can you feel the resentment at what should be your comfortable retirement years? *Simon Dippenaar & Associates Inc. (SDLAW) is a law firm in Cape Town and Gauteng with specialised divorce attorneys and family lawyers. Contact us on +27 (0) 86 099 5146 or info@sdlaw.co.za. This entry was posted in Divorce, News and tagged adult children, grey divorce, retirement. Bookmark the permalink.